As far as I can tell the question is: Do INS put fake thrusters on the ships to simulate aircraft flight, or do we simulate true atmospheric forces and fake the ship aerodynamics? I’m leaning towards the latter but it sounds like it needs to be a bit of both. @Playbenni you mentioned a desire to make jousting/turretting less common/possible. Achieving this would require not only enabling swoopy lift-based manouvres, but disabling the rotation and hovering facilitated by thrusters. 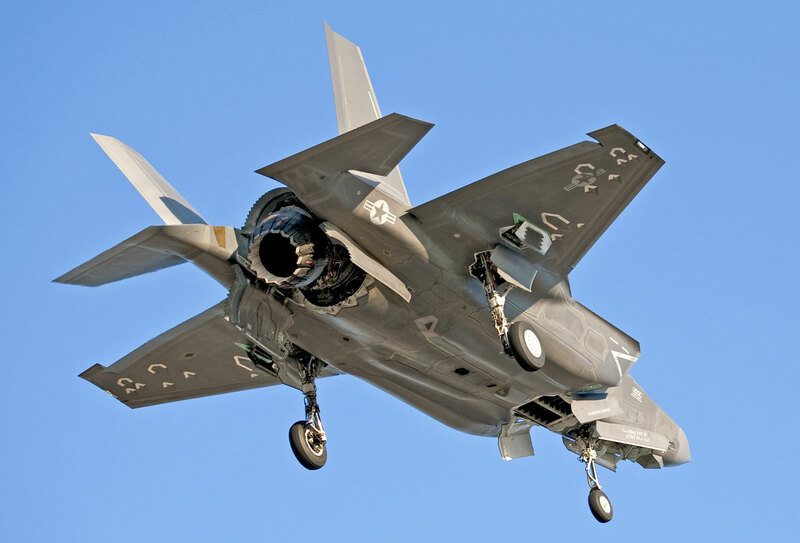 Vertical thrusters of an F-35B are also small, but still, they provide enough thrust to handle “maximum takeoff weight of 60,000 lb (27,000 kg)” (from wiki). 27,000 kg of force plus some aerodynamic drag is enough to turn the ship while in flight, not fast as with wigs but enough. A spaceship fighter is not designed to be as good fighter in the atmosphere as it is in space. I don’t understand the focus on realism, what is to be gained by it? The F35b doesn’t have separate vertical thrusters. Its all one giant engine. How exactly? If you assume that the ship is made of normal material rotating such a ship during high speeds would rip it apart violently anyway. The design of the ships as it is now is so unaerodynamic that it is hard to believe that it would endure high speeds without breaking apart, we have to assume that either it is made of super materials or there is some force field that shapes its aerodynamics. My question is: What would this cherry-picked realism add to the game, other than cherry-picked realism? If they would go with the explaination of a force field that shapes the aerodynamic properties of the ships it would allow for some cool things. For example if the shield generator shapes the force field then we could have different modules or modes on the generator that each offer a different shape which in turn affects the handling of the ship. All of the ships thrusters have immense thrust. You guys should whatch the speed gauge every now and then. My theory why it doesn’t feel good is because people aren’t used to cruise arround without a speed cap. Above that speed and the thrusters, even with their immense thrust and additional boost isn’t enough to controll the momentun that has been built up. It’s not about cherry picking realism. It’s about trying something to see if it’s fun. Maybe bricks in air is fun. Maybe wedges, cones or simplified ship shapes are fun. Do we know yet? I don’t think so. There’s also the aspect that overall gameplay would benefit from having different flight characteristics in an atmosphere than in space. As the ships get larger they should be less “airplane like” in an atmosphere. Intercepter: Like a brick in space and like a plane in the air. Corvette: Like a brick in space and like a brick with fins in the air. I agree momentum currently overwhelms control (unless excessive use of boost). I also agree fun is the most important thing (although this is subjective)! I agree all of this needs comprehensive testing and feedback, starting now! Perhaps we should all jump in the prototype (those who can) and nail down what we like and don’t like? Then analyse the changes made in the next patch and decide if it’s an improvement. I became quite accustomed to the current atmospheric flight model and actually really enjoyed the challenge and reward of thinking ahead and managing throttle and boost. However, and I think I may have mentioned this a long time ago, it would be nice if the throttle could still be set while not in stability assist mode (I may have forgotten the terminology of these systems) to more appropriately emulate an aircraft. Something I haven’t tested: do weapon effective ranges get shorter in atmosphere? Less range would encourage slower flight, which in turn reduces the momentum issues on the surface. Taking this a step further, perhaps there’s very little problem with the atmospheric model at all - is it a problem with the Flight Assist and how it feels in atmosphere? Ships would have to fly more like rocket planes if Flight Assist didn’t work as well in atmosphere. (Perhaps the thrusters are much less effective, as they are designed for a vacuum). I’m posting this to reference the current prototype version. This is me flying the interceptor with Flight Assist off, in order to get a better idea of what effect the atmosphere was having on the ship. I would call this a stable forward flight, as the travel vector indicator was consistently on or above the horizon. Speed maintained by holding the Forward Thrust key at around 400-600 m/s. I was having to maintain that angle of attack (which unfortunately I can’t measure!) to keep the ship from crashing (see the targeting reticle). This can be seen also in this screenshot. Given that the interceptor is probably the most aerodynamic ship so far, it feels a little awkward that - even at those speeds - it still doesn’t like to stay up in the air. I think a separate problem is that the ship orientation is constantly glued to the mouse. It doesn’t feel like the ship fights back against what I’m trying to do, but I believe @INovaeFlavien was working on a different control scheme? Or there was a conversation about it? Secondary verdict: Flight Assist Off felt more interesting to fly in atmosphere than Flight Assist On. It wasn’t brilliant, but it felt more familiar, like a spaceplane and not a magic go-anywhere brick. I did not vote because I would prefer the best of both worlds . I am all for realism, and I would like IB to be not just a goood game, but also a good simulation. So I am expecting some kind of “realistic” physics that let me feel like I am actually in control of a cleverly simulated spacecraft. Now, let us not forget we are talking about a Scifi universe, which means the spacecrafts we’ll be flying are using some technologies far from our 21st century knowledge. I have no access to the IB prototype, but I really like the flight model that I see in the videos showcasing IB. IB ships look like bricks … so what ? Their designer certainly make them controllable, in a way or another, with their available technology. And we certainly need lift to gain some control in atmospheric flight, so it is just a matter of imagining a sensible but coherent technology to imput in the current game physics to get a clever and coherent simulation. I kind of like the plasma idea . All that matters is that we end with some coherent physics enabling some fun gameplay . In some way, I am expecting the low altitude low speed flight model to be like an airplaine ( using lift provided in … whatever way you can think of ). I have no idea what to expect from the high altitude hypersonic flight, but, again, I really like what I see from the prototype so far ( althoug without having the ability to try it ). Because why would a pilot limit themselves to doing a plane-like swoopy turn to reacquire their target when instead they could just rotate to point directly at them? If the thrusters are powerful enough to rotate the ship (which they are in space, and as ships are bricks there is no significant vertical stabilisation preventing lateral rotation in an atmosphere) then why would a pilot not rotate the ship? If you assume that the ship is made of normal material rotating such a ship during high speeds would rip it apart violently anyway. The design of the ships as it is now is so unaerodynamic that it is hard to believe that it would endure high speeds without breaking apart, we have to assume that either it is made of super materials or there is some force field that shapes its aerodynamics. There are two forces that could potentially lead to something breaking apart when rotating at high speeds; centrifugal force (inertia vs centripetal force) and aerodynamic stress. Ships can spin around without problem in vacuum so we can discount centrifugal force as an issue. That leaves us with aerodynamic stress. As has been repeated many times, ships are unaerodynamic like bricks. If we consider a modern aeroplane for a minute; it is designed to be aerodynamic in one direction of travel, its components are designed to be strong enough to resist the drag they will experience during normal flight and to some amount of deviation from normal flight - ie it’s not designed to be pointing perpendicular to the direction of travel and if it were forced to by a magic force, it would break. A brick on the other hand would take an incredible amount more energy to break as all parts of it are approximately as strong in all directions. On another note, I think it’s important to acknowledge that lift is separate from lateral stability. A circular disk with some AoA into the airflow can rotate about its centre with no effect on the lift produced and no keel effect to counter the rotation. even a brick has some lift at some angle of attack. just use simplified real like model. less brick like ships will act more like a planes automaticly. if somehow shield must be turn off in atmosphere you could add some new game mechanic - maximum aerodynamic load on hull. so if you at some point too fast, have too dense atmosphere and too big angle of attack your ship could be damaged by this forces. The use of shields to enhance flight characteristics has been discussed, but I think hardpoint modules affecting aerodynamics should be explored too. For example, a bomber might be able to mount one capital missile tube with vastly increased drag, or a destroyer could mount extra thrusters on some hardpoints to give it more acceleration. 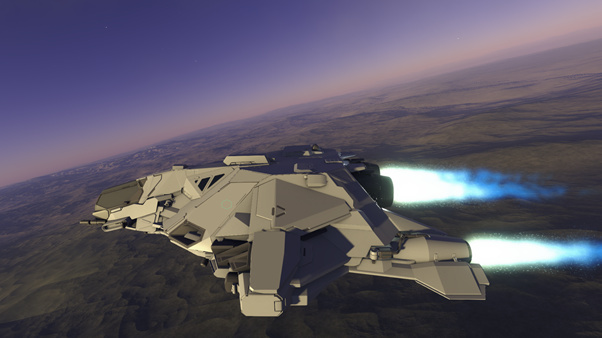 If you can hover that you can use the same thrusters to aid the change of direction without any “aerodynamic shielding”. Hovering is just … hovering . On Earth this means you need a 1g+ thruster, but if you are to manouver tightly you need way more than 1g thruster. A 9g tight circle means you need a 9g acceleration, provided either by actual lift … or by thruster. And as far as I can understand, hovering is not a problem with the actual prototype, thrusters are prowerfull enough. Yeah because the thrusters are akschually only 3d models and the real hovering is just code. That however doesn’t mean that the thruster sizes and layout is realistic which was my point. Why force realism on the flight model because of the ship design when the design itself is rather unrealistic? !